Hello everyone. 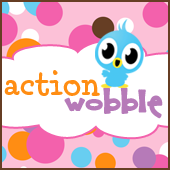 Heather here with another post for Action Wobbles. Today I used a cut from Create a Critter. It is a card that I plan on giving a friend who has been very supportive over the past couple of months while I've been dealing with some difficulties. I just want her to know how much I've appreciated her and her support.